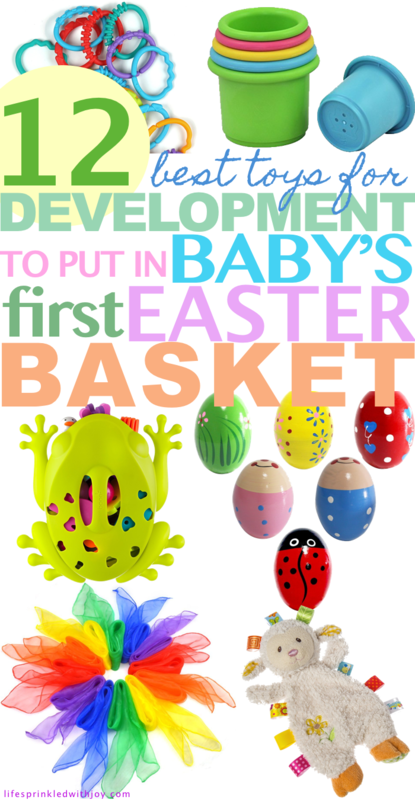 Easter is right around the corner, and you may find yourself at a loss about what to put in your baby’s Easter basket. All I can remember getting in my Easter basket as a child was candy, and I know Squiggles can’t have any of that stuff yet. And I already have enough baby stuff in my house, do I really any more baby toys? The truth is…no, you don’t. 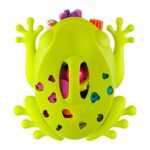 A lot of baby toys out there promise to be educational or beneficial for baby’s development, when all you really need are a few toys that can be used in multiple ways as your child grows. When it comes to getting baby toys, you want to look for toys that: 1) allow YOU and your baby to ask questions and explore different scenarios (what happens if I do this? what happens when you touch this or pull that? etc.) 2) resemble real-life objects to better encourage word associations and relationships (REAL pictures of animals, fake phones or keys, etc.) and 3) have a variety of textures, colors, and noises. 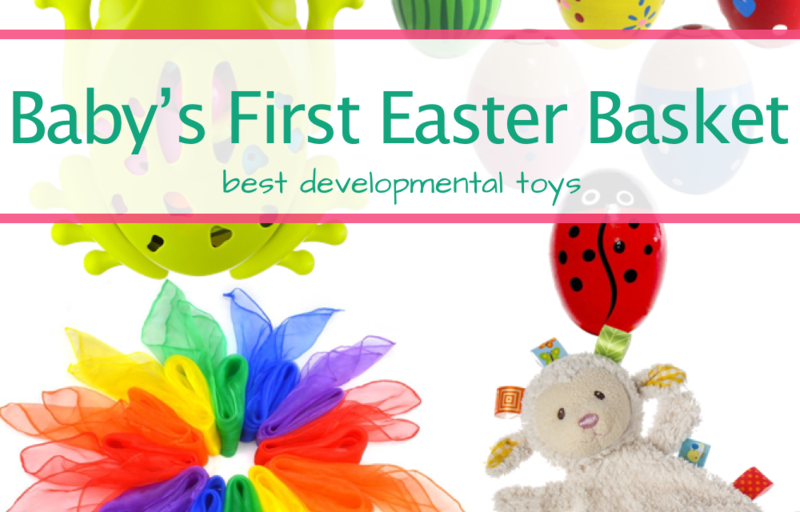 Here are a few toys that are great for baby’s development during that first year. If you have similar toys already—that’s fine, use those! Use Easter as an opportunity to inaugurate baby’s first official toy rotation. It won’t be easy to find a baby who doesn’t enjoy bath time. Lately Squiggles crawls from end to end chasing the bubbles, and is mesmerized when I turn the water on. I had few plastic squirty toys at first but I was always so considered if mildew was building up on the inside. And since all Squiggles does is put these in her mouth, I need to fine a safer option. I love Boon Bath Toy like these. The clean-up is easy, the design reduces mildew build up, and these are BPA, PVC, and phthalate free. In the early months babies learn follow objects with their eyes, then learn to grasp objects, and build toward transferring objects from hand to hand. And of course, oral exploration. Now that Squiggles is 10 months she is starting to understand objects can go on top of each other or inside of another. 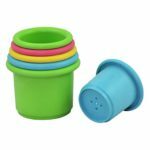 Nesting cups like these are great too because they are plant-based and BPA free. 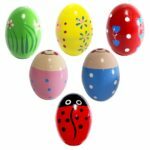 Musical egg shakers are another create toy for developing hand-eye coordination and for practicing passing items from one hand to the other. Expect these to end up in baby’s mouth—that’s okay, because these wooden egg shakers are made from high-quality wood and coated with non-toxic paint. 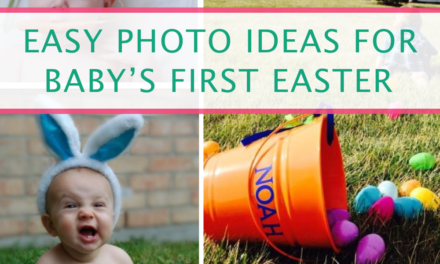 Plus, they go well with the Easter theme! Music of any kind is great for baby development. I started doing mommy and baby music classes when Squiggles was 4 months old because that was the only organized class I could find for her age. Seriously, check out if you have any Music Together offerings in your area. You won’t be sorry. Figure puppets are a great way to encourage your baby to follow objects, and they can be great to make tummy time a little more engaging. Place your baby on a safe, raised surface (exercise extra precaution if your baby has started rolling), and give them a little puppet show. 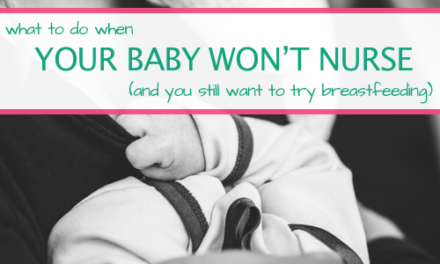 Babies should be in tummy time at least an hour a day when they are younger to help them build their back and neck muscles, and this can be a good option to help them enjoy this time a little more. If you go for animal figurines, I like these ones because they are big enough so you won’t have to worry about choking and can be played with for years to come. 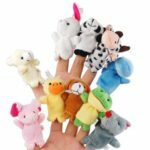 As your baby gets older start making the associated animal sound with each puppet or figurine, or use these toys to help teach your baby about object permanence. And of course, using the animals to play peek-a-boo never gets old! The fascination with phones, or any “toy” mommy and daddy play with, starts early. And as parents we know those kids see us with our phones a lot… I can’t go one day without taking AT LEAST five photos of Squiggles. When Squiggles was turning to crawl we (shamelessly) used the phone or t.v. remote to motivate her. We always kept it out of her reach, but so many times now I turn away for one second only to come back finding her with my phone in hand, looking so pleased. 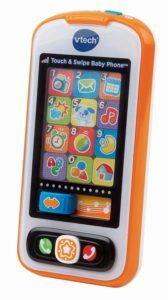 We got Squiggles this play phone last week and she loves touching the buttons and—let’s face it—chewing on the ring. I love that the email sound sounds exactly like one on my iPhone, and Squiggles will dance whenever the ringtone plays—so funny! What’s nice about these in-real-life toys is that, well, they look like the actually object they represent in real life. This helps baby learn and make object and word associations. Our babies’ brains are like sponges, so help them make those relationship associations with some fun real life toys. Okay, so this one might be a little too big to fit in your baby’s Easter basket. 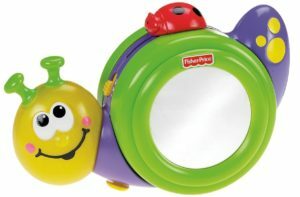 Squiggles first encountered the snail mirror toy during our physical therapy sessions, and she loved it so much I had to get her one for home. It was great to use during tummy time—babies love seeing their face in mirrors! We’d put the snail toy to the right of her head to get her to turn right (since she had torticolis). As she got older she chewed on the antennas when she was teething and dance to the music. I’ll admit—this wasn’t the rattle we had for Squiggles. It’s the rattle we WANTED TO GET but couldn’t find. Our physical therapist would always use easy grip rattles like these to encourage Squiggles’ hand-eye development, and she always loved them. Turns out it isn’t so easy to find a typical baby rattle like this in the store nowadays. Most baby toys are no longer simple—they have buttons and tags and lights and ooo-its and whats-its galore. When it doubt, choose the simpler toy. Babies need to nurture their creativity, and getting toys that do all the work for them doesn’t help them in the long run. Spring is almost here. Living in Chicago I feel like it’s been months since I’ve been able to go outside without my down parka. We’ll FINALLY be able to get out of the house. And play. Squiggles has always loved bubbles—especially when my niece blew them a little too close to her face. What’s great about these bubbles is that they’re cheap and nontoxic, so you don’t have to worry when baby dumps them all over herself (which I know will happen the first time I take these out to play). 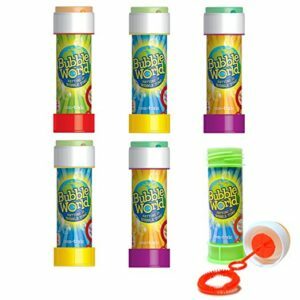 Enjoy baby to track bubbles with their eyes or chase them as early walkers. These taggies crinkle paper tag toys are the perfect combo. Squiggles still loves to chew on the tags, and these were lifesavers when she was smaller when we were out and about—just toss it in the carseat or stroller with baby and they’ll stay entertained for hours. Okay maybe not hours, but it should buy you 10 minutes. 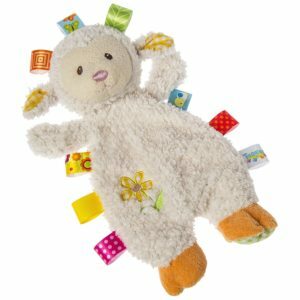 These taggie toys, especially ones resembling stuffed animals, tend to end up as lovelies for your little ones, so make sure you don’t drop them and lose them (like we did…whoops). Board books are great for babies because the pages are durable and easy to grab and turn with those little fingers. I’ve tried reading other books with paper pages to Squiggles but I get worried she’ll get a paper cut as she tries to turn the pages. We got her first touch-and-feel board book for our last plane flight and she was so mesmerized by animals and loved touching the animal fur. Now that she’s older we are starting to let her pick out what book to read at night, and her touch-and-feel board book is definitely the one she goes after first. I love this one because it’s all about bunnies, which is perfect for an Easter basket. Books that include bright and contrasting colors are great for little babies, as well as books that include actual images (instead of just drawings) of animals. As a parent I will say that these baby link toys are essential for traveling or when you are out and about running errands. 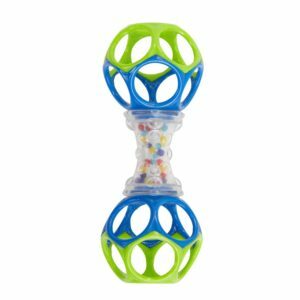 Connect toys that are easily dropped to stroller or carseat straps with these links and you won’t have to worry about toys falling and getting dirty. 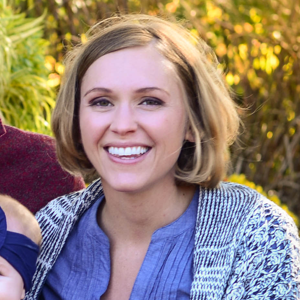 When we flew with Squiggles (first when she was 6 months, then again at 9 months) these links her a lifesaver—teether, pacis, rattles, all connected to our carrier via these links. 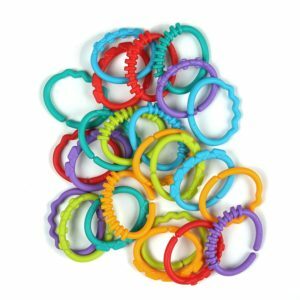 Babies can use ring / link toys in so many ways—to chew on, to clang together, to feel, and eventually to link together themselves. This is a toy that you’ll keep on using even after your baby turns 1, and being so cheap you might as well get a few packs because you will lose most of them. 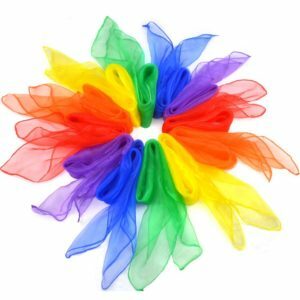 Colorful scarves like these are perfect to helping baby experience different textures and movement. 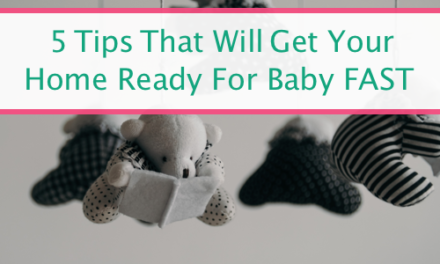 Lie your baby on her back and sweep the scarf lightly over head and across her body. Combine these movements with music and turn it into a fun game. Like everything within baby’s reach, these will probably end up in her mouth at some point (okay, maybe all the time). Maker sure you are watching baby closely whenever she is playing with these scarves. As baby gets older she can grab and wave the scarves on her own! I hope these toys will be helpful tools in helping your child grow and development in her first year. One of the best thing we can do as parents is interact and play with our babies, so be creative, make up games, and have fun! NextBest Stomach Exercises To Get Rid Of That Post Baby Belly FOR GOOD!